Hanging with Grandma in the ice fishing house on Mille Lacs...what awesome light, huh?!? A close up of my adorable boy!!! Hanging out with daddy...look at how big he has gotten!!! 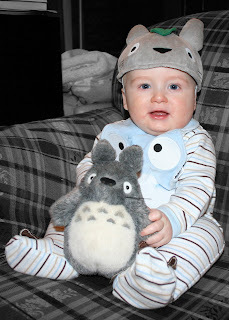 In his Totoro get up that we got him in Tokyo...he finally fits into the hat. YAY!!! is sitting up on his own for very extended periods of time. It's so awesome...he can play sitting up for a really long time. is rolling over like a champ these days and enjoys going from his belly to his back over and over again. is walking in his walker...he used to just sit there or go backwards, but now he's motoring about...I caught him exploring the kitchen today and find all sorts of things to play with. Baby proofing here we come! wears 6-9 month, 9 month and now even 12 month clothing! is making more and more sounds all the time...very chatty still and giggles and laughs like crazy; especially when daddy gives him whisker rubs on his chest on Sunday nights. still enjoys jumping in his horsey jumper and LOVES all his new toys that Christmas brought him. still no teeth...over Christmas he was teething like mad; so fussy, constantly drooling and gnawing on things but they still have yet to show up. Eats lots of things and loves to put the food we are eating into his mouth; his favorite foods include squash, sweet potatoes, reg. potatoes, apple and pear sauce, bananas, green beans. We also tried cauliflower, but HATED it...there was an incident with throwing it up and it coming out of his nose...so not fun. has had quite the cold over the last few days, but is finally getting over it. 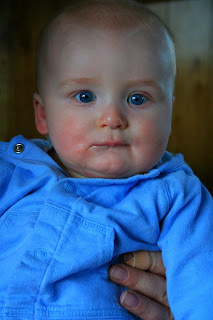 Will take his first road trip to Chicago this weekend to go to the Muskie Expo and the Japanese Mall...another YAY! Great pictures of the little tyke! WOW...I cant not beleive how big he is already! Goodness they grow fast. He is a cutie.